Saturday morning Cindy was doing a spin class so I decided to go into old school chore mode. I was outside in the brutal heat and humidity until almost 11:30 weeding, weed whacking and attending to other outdoor to do’s. 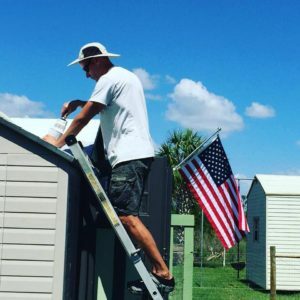 After lunch I went back outside to apply the chocolate colored stain/waterproofing I used on the rain shelter last week to other wood structures in the yard that were in need of it like the small shed ramp, dog deck frame, and the jump table in the bar park. In total I changed my shirt three times during the day after I sweated through them. Late in the afternoon I decided I wanted to tackle the only remaining project on my mental list, installing a shelf over the big tv. This is actually something I did once before around 2003 when I had the 61 inch Sony projection tv. At that time it was used to house the AV equipment. 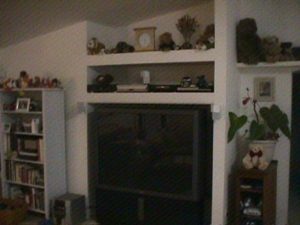 When I bought the 73 inch DLP TV and the tv stand for it to sit on I had to rip the shelf out because it was too low. When I pulled the shelf I actually put the boards in the large shed toi be used again on a rainy day. Well that day came Saturday, some 8-9 years later. The reason I wanted to put a shelf up was to have a good spot for the center surround speaker. 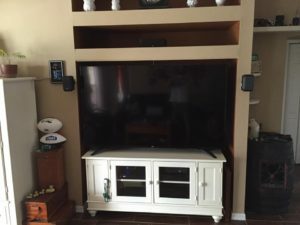 With the 73 inch tv and now the 70 inch 4K set I had that speaker on the surface of the tv stand in the middle. Well with the new TV if I put it in the center it blocked the IR receiver for the set. 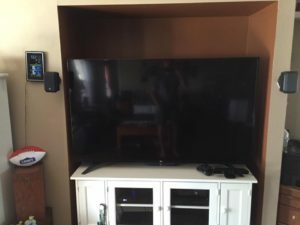 I thought I would be creative and place the speaker behind the tv. The problem was since the speaker was partially obstructed, the dialogue for shows, which usually comes through the center speaker was somewhat quiet, requiring me to turn the volume up higher, making loud portions of a movie/show overwhelming. Having that speaker right above the set seemed like a much better option, plus it would help fill up that gap of dead space to the top of the nook. When I tried to explain my plan to install the shelf to Cindy she was a bit unsure of how well it would work. I assured her I did it once before successfully and I could do it again. Having the shelf and trim board from the old shelf still available meant I didn’t have to worry about measuring or cutting new ones. Cindy used the palm sander to clean up the old lumber. Sitting in a storage shed for that long had made the wood dirty and dingy. I used 2×4’s as the side supports for the shelf. Getting the shelf to look right is all about getting it even so I did a lot of measuring and leveling to ensure the boards on either side were right where they needed to be. After a couple hours of work the new shelf was in place and looking good. Having the speaker up there was definitely an improvement, I could now hear the dialogue coming from the tv without cranking the Yamaha surround to concert levels. It was quite a busy Saturday but I felt good getting so much accomplished. Of course I shot video of the work. If you would like a more detailed view of how it went down, look here. On Sunday morning I bugged Cindy about going out to run. It wasn’t because I loved the idea of running in the miserable heat and humidity. I just did not want to lose the small amount of progress I have been making with my running. Last weekend with Supercon and construction projects I did not get out to run at all. If I missed a second consecutive week I felt like I would be back at square one. We did not start our first lap around the track until after 8AM so the sun was already high enough in the cloudless sky to start broiling us. I felt pretty miserable the entire run but I expected to. We completed 13 laps around the track at a 9 something per mile pace. I was beyond drenched with sweat by the end of it but I glad I put the time and effort into getting out to run. Sunday had a definitely more relaxed pace to it. 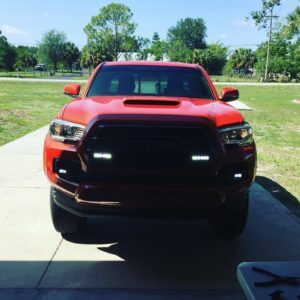 I did a few things including washing the Tacoma, during which I recorded two videos. One regarding a shift delay I sometimes experience going between reverse and drive and the other being a 2500 mile review of the truck. It seems like anything I post regarding the 2016 Tacoma is getting a lot of views on YouTube. The one video has almost 500 views already which is a TON for the first day. Speaking of my YouTube channel, things have really been accelerating since I crossed the 1000 subscriber line. While the first 1000 subscribers took me some 8-9 years to accumulate, I have gotten my next 100 in about a month. I also am less than 20,000 views from a million total on my channel, another big milestone for a small time YouTuber like myself. My content may not be universally popular but it definitely does fit a certain niche. I am following the advice of Casey Neistat, a very popular You Tuber when it comes to how to grow your channel. Just keep uploading. Sunday night we watched the Peanuts movie. I have always been a big Peanuts fan all of my life. The holiday specials and the cartoon strips were some of my favorite things growing up. Seeing the way they animated the characters for the film was odd. Most everything in the film was 3D rendered which honestly looked disturbing in some ways, like the hair on Charlie Brown and Linus’s head. However the facial expressions were done in an old school way like the old specials. For the most part it worked and did not mess with the feel of the movie. I thought they also did a good job of getting voice actors that could perfectly replicate the characters as they sounded in the 60’s and 70’s, something that was not the case with some of the more modern Peanuts specials that were produced. Despite the pressure of it being a feature length film, I think they did a good job of making the story authentic, touching, and fun in a similar manner to what made the characters so endearing to us as kids. Although I had no desire to spend theater type money to see Peanuts on the big screen I was quite happy it arrived in it’s Netflix envelope. I pity kids today that have no modern day equivalent of Peanuts to look to. Most are far too busy being mesmerized by their portable screens to appreciate someone like Charlie Brown or Snoopy. The movie is a quality B+ addition to the massive Peanuts collection. We started watching The Preacher on AMC, another comic book based show. AMC did great with this formula with The Walking Dead and it appears they have another winner on their hands. It is bizarre, crazy, and cool. Check it out. One of the nice things about this training week is that class doesn’t start until 10AM each day, giving me bonus morning time I am unaccustomed to. Today I used that time once again to get a run in for the second time this week. I chose to log the 3 miles indoors on the treadmill. The run was the third time I had run in 5 days. I can not tell you the last time that has happened, I may have been in my 30’s. It also means for the week I have run about 10 miles. I haven’t had double digit running mileage totals in a week for a period of years either. Although my pace still is pretty damn slow, my hope is if I am able to continue to run without major injury problems, the speed increase will come naturally. While I was on the treadmill I fired up Full Metal Jacket on Netflix. I saw the movie once when it came out nearly 30 years ago so my recollection of detail was very poor. It was almost like seeing the movie for the first time. It reminded me why the movie has been revered as one of the best war movies of all time. There are so many classic lines in the film that I lost count after 20 or so. I am winding down day four of my training. It has become a bit of a slogfest as we are covering features of Office 365 I have no interest or need for. One day to go. When I got home yesterday I had several boxes waiting for me. Five of them contained the safety cones I bought online from Walmart for a reasonable $5.50 a pop. I now have enough cones to handle my needs around a finish line however if an event needs cones out on the course or for other reasons they are going to need to provide them. I also got back a replacement for the flaky automatic coop door motor. I could tell immediately that what I was sent was not a brand new unit but as long as it works that was what mattered. 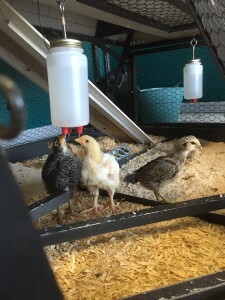 I changed and went out to the coop to immediately install the motor, having to manually open and close the coop door has been a bit of a pain. As I sat on a bucket reinstalling the unit I had an audience of several chickens, all hoping that somehow I was going to shoot treats out the top of my head, since that is what they most associate Cindy and I with. After mounting the motor I did a number of test opens and closes so I could adjust the tabs on the motors that control the amount of movement. I now have the door set up so it opens a couple inches higher than it used to which is helpful since the chickens are full grown, needing as much clearance as possible. Last night and this morning the door closed and opened on schedule. While I was out there I wanted to get a set of pull ups in. I have been trying to do 1RM sets of pull ups after work most weeknights. Last week I had worked my way up to 22 reps on my normal pull up bar. I thought I would mix it up and do my set on the 11 foot high bar last night. Doing reps on the high bar is more difficult. First you have to climb the 1.5″ diameter galvanized pipe up to the cross bar. Holding onto the fatter pipe makes repping tougher as well as I can’t wrap my thumb. The creaking and groaning I heard from the structure while I was up there did not inspire confidence either. I only managed 15 reps before I dropped back to terra firma. My buddy at work turned me on to a documentary series on Showtime called, The Circus: Inside the Greatest Political Show on Earth. It is a fascinating look at the the 2016 presidential primaries as the crew from a Bloomberg TV show follow around ALL of the candidates. You get a true behind the scenes look. It will make you like some candidates more and some of them less. Some may also find it disturbing seeing the fickle, lemming mentality that swirls around American politics. Each episode is only 30 minutes long so it is easily digestible. If you have Showtime I strongly recommend you check it out. 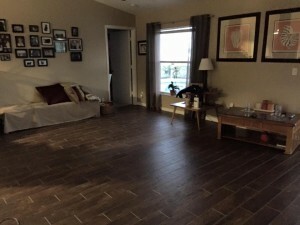 This morning before work we did some shuffling around to prepare for the new sofa and love seat that is arriving today. The first prep was to remove the retractable screen door hardware by the front door as it can cause tripping and clearance problems. Second Cindy and I lugged the old sofa out to the garage so it was out of the way yet still available to be picked up by Cindy’s daughter. The sofa was heavy and unwieldy, I felt badly having Cindy carry the one end of it. We used the furniture sliders to get it to the front door and then brute force carried it out to the garage. Cindy and I started watching the new OJ series on FX last night. It has a star studded cast and based on episode one is going to be a pretty interesting series. Of course most of us remember the OJ murder trial well, even though it went down 22 years ago at this point, which seems hard to believe. If episode one is an indicator, there is going to be a lot of detail about the murders that the general public may not have been aware of. Set your DVR. Last night I did not watch one second of the State of the Union address. I instead passed the time doing data work for the half marathon and then fell asleep watching a home improvement show on HGTV. I just had no interest in Obama’s final SOTU speech which is always filled with skewed numbers, partisan clapping, and fluff. Unless Bernie Sanders somehow manages to beat the odds and take down the Hilary juggernaut for the democratic presidential nomination I really am sort of burned out on divisive, toxic, corrupt American politics that excel at little else than manipulating the majority of the general population while quietly stuffing the pockets of those that own the politicians. 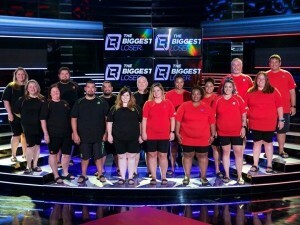 Cindy and I still watch some reality tv shows, one of which is The Biggest Loser. For some reason some genius decided the show needed to be completely rebranded this season. They redid the house, the gym and the logo for the show which I guess is fine, although I think the new logo is really unimaginative and dumb. What wasn’t fine was the loss of Alison Sweeney as the host of the show. It all seems foreign without her there. She was such a good source of positive energy, it is really disappointing to see that removed. I have to admit I also found it intriguing seeing how they changed Ali’s outfit, hairstyle and make up for each segment of the show. I enjoyed discussing what I liked and disliked about her look in each scene with Cindy. The show has undergone many changes throughout the seasons that mostly involved different trainers and changes to some of the rules. Some of them were good some were not. This latest change feels like the biggest yet and my initial feedback is I don’t like it. Watching obese people both succeed and fail towards their goal of weight loss is interesting tv for sure but certain cast members help define the show. Ali was one of them. 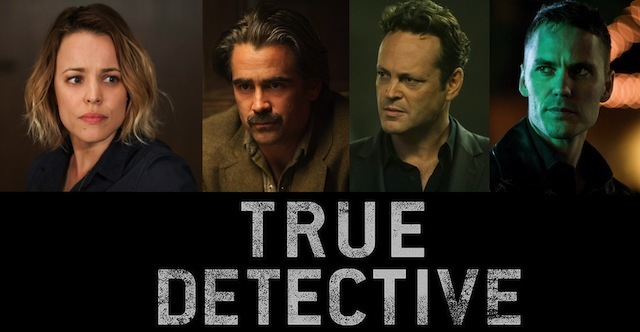 Last night Cindy and I took in the season 2 finale of True Detective. Although I enjoyed season one more, this year was good as well but a bit frustrating. The story had too many facets to keep track of accurately. If you asked me to clearly explain how everything was connected now I would be unable to do so. It didn’t help that I watched a couple episodes when I was half asleep meaning I missed out on a few details. I thought it was quite interesting seeing Vince Vaughn play a bad guy. Until now I associated him with solely playing the lead role in a string of average comedy films. I think the only film of his that I really found funny was Dodgeball. Anyway, it took some time for me to shed those past impressions of him as a silly/comedy guy but once I did I appreciated how well he took to the somewhat honorable villain role. Part of my comprehension problem had to do with Colin Farrel delivering a lot of his dialogue in a mumbly manner with a volume slightly above whisper level. I guess it was part of the character but it made it hard to follow without cranking the volume way up. The ending of the story was appropriately tragic, you don’t expect to come away from the show with a cute fuzzy bunny sense of the world. 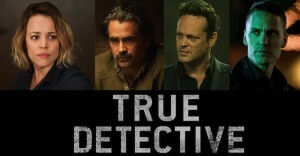 If you don’t mind shows that capture the dark underside of humanity then True Detective should be on your dvr. I still have been having the phantom smoke smell come and go although lately it has been a lot more come than go. Yesterday I had the smell in my head for most of the day including all of last night. I smell it somewhat right now. If this continues into next week I will probably get the ball rolling to at least rule out anything significant going on. If you aren’t a Stern fan the next few paragraphs will mean nothing to you, feel free to jump ahead. So I have been a Stern show listener since the late 90’s. I jumped right on board and started paying my monthly fee to Sirius when he left terrestrial radio back in 2006, I enjoyed the show that much. The first few years on satellite were awesome. Being freed from the constraints of regular radio resulted in some incredibly different, creative and entertaining content. The start of the decline was when Stern announced he was no longer doing 5 days a week, the show would now only run Mondays-Thursdays plus the nearly two months of vacation they take on top of that. When that first reduction in content was announced I recall ranting about it pretty hard. However upon reflection the reality was Howard was approaching 60 years old and he certainly has earned the right to work as much or as little as he wants. Howard TV, the video part of the show that provided the visual portion of the entertainment experience was shut down with little to no explanation on air from Howard. The departure of the tv content meant the departure of a number of people whose on air personalities were entertaining and interesting as well. Despite my dislike of his political views, I really miss hearing Scott DePace on air among others. The Howard News team has been slowly pruned back as well, their staff and on air minutes have dwindled down to next to nothing. John Leiberman, who is extremely good, had his own short daily show that also vanished for some unknown reason. 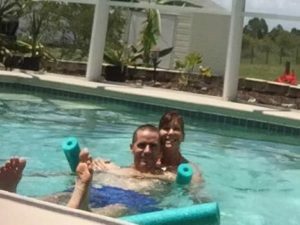 Lisa G, another long time news crew member departed recently, again with little to no on air discussion about the reasons. Finally, Howard trimmed yet another day off his broadcasting schedule, now only doing live shows Monday-Wednesday. Having only 3 days has had some additional side effects besides the obvious shortage of live content. The shows have become overly interview-centric. Howard is a good interviewer and for the most part the interviews are interesting but they take up way too much show time now that there are only 60% of the broadcast hours there used to be. The best part of the show was the unscripted interactions between Howard and the staff. There just is not much time to allow those type of interactions to develop when you have two or three celebrity interviews lined up every show. Speaking of celebrity interviews, they made another recent change that made no sense. In an effort to offer fans at least a little more live content the channels put on The Wrap Up Show where topics from that day’s show are discussed. The Wrap Up Show used to be a round table of various Stern staffers discussing/arguing various points. It was funny and entertaining to hear the staff be able to expand on their points of view while not being under the ADD arm of Howard who runs out of patience quickly when anyone other than himself is talking. Some genius totally scrapped that format. Now the Wrap Up Show consists of Gary and John talking to random “celebrities”, most of which the audience knows little about, each day about the show. It totally removed any enjoyment I got from TWUS. I have no interest in hearing some 3rd party I know little to nothing about who happens to like the show talk about it. Give me more Sal, Ronnie, Richard, JD, and the rest of the back office crew. Even on their worst day they are funnier than what TWUS has been putting on air nowadays. There are many more examples of subtractions from the show (why no discussion of Tim Sabean leaving, interns, Jackie, Bubba) I could lay out but you get the drift. 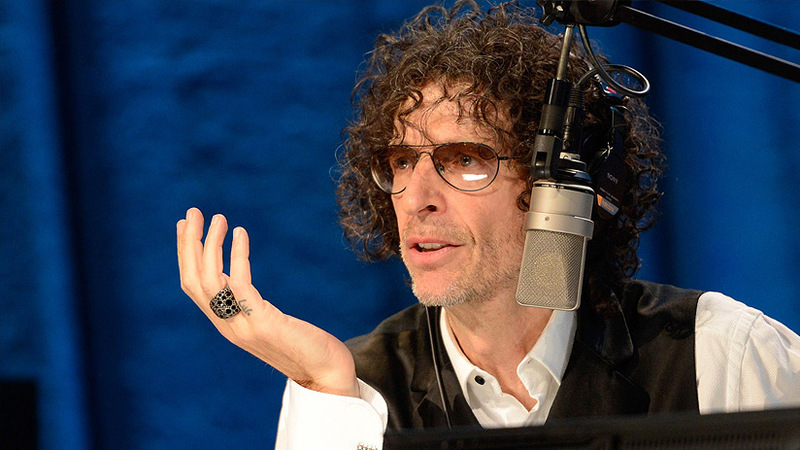 Howard is approaching the end of his second 5 year Sirius contract and as he usually does, he has been waffling about his intentions to sign back up. He is now something like 61 years old so it would seem to most that would be a good time to call it quits. I am starting to come to that same conclusion but not because I don’t think Howard still has “it”. He still has all the tools/staff at his disposal to make great content. But if his intentions are to become more and more like a dirtier version of Barbara Walters while pulling back on all the other parts of the show that brought us all so many laughs in the past I am just not that interested. It’s frustrating to me that despite his clear intent to produce less live content personally, Howard seems unwilling to let other members of his staff step in to fill the void. Man I would love to see/hear a Sal and Richard show. One much shorter show related rant has to do with Survivor, a show I still enjoy and had it’s 30th season finale on Wednesday. I don’t understand why they decided to make the finals of the show three players instead of two several years ago. It dilutes the ending of the show and pretty much everytime, one of the three people in the finals gets zero votes. I would love to know how the producers of the show think 3>2 in this scenario. I can’t imagine any explanation that makes sense. Last night we did the big integration of the two sets of chicks. When I got home Cindy was inside the chicken run that has been in the garage. She was trying to attach some plastic netting to allow us to flip the run upside down and use the netting as a retractable roof. She had been working hard in cramped spaces and was not having fun. Perhaps that is why she did not immediately warm up to my alternative suggestion of carting the main chicken tractor up to the garage and letting all 11 chicks hang out there. After all they will be living in the tractor for around another month yet outdoors so I figured it would be good to get them used to it. Like I said Cindy at first was skeptical since it was not quite as long as the chicken run. I told her I was positive it would be enough space for the chicks plus it has the deluxe second level coop accommodations they can hang in as well. 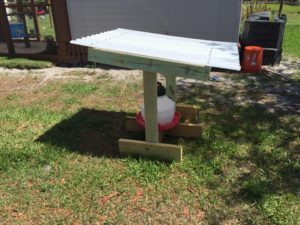 I carted the coop up to the garage from the back yard and we worked on getting it ready. Once it was set up we first let the older chicks in. They have been in the chicken tractor outside a few times so it wasn’t a big deal to them. When we added the younger chicks in things got interesting. At first we were very surprised, a couple of the younger chicks were actually acting aggressively towards the older, bigger ones. Later on some of the older chicks were picking on the younger birds. Despite the squabbles I thought it actually could be more dramatic. All of the chicks shared food/water side by side at one point or another so long term I think they will be fine. At this point there seems to be a clear light chick/dark chick segregation going on. The five youngsters and six older chicks mostly group up with their own flock. Cindy and I can’t wait till it’s one big happy feathered family. I am looking forward to my four day long Memorial Day weekend. Having 4 days off gives me time to get stuff done and still be able to stretch out and smell the roses, or play WoW.